Description: Well, The "Nostalgic" itself always is an emotional memory of our early days of life, which we never forget, which is always being with us. Those exciting memories always feel us happy. and make sentimental. .Same happened with me. I never forget those memories of my early days. Where I most of the time spent with the steam locomotives. Day by day I was running to the locomotives. Still, now, I remember the steams coming out from the black engine, I love the sound of whistling .Choo. Choo. Choo. Those were most happiest day in my life. 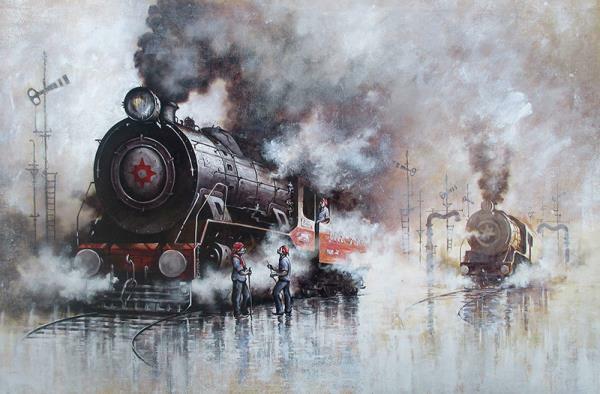 Those memories are always recalled, and influenced me to do the series of canvas on the steam locomotives . That's the story behind the TITLE of "Nostalgia of Steam Locomotives"